There exist a large number of myths about monster catfishes. The myths has different bases but the perhaps most common monster catfish myth, a myth that surrounds just about every lake in the US is the myth about a huge giant monster catfish that supposedly exists in the lake and that has eluded fishermen for a long time. Granted most of these myths about monster catfish are just that myth but many of them can contain a grain of truth or at least used to do so. The truth is that there are a number of catfish species that can grow very big, these fishes can reach 1.5 m/ 5 ft in length and grow to be 40-50 years old. These large monster catfish are becoming increasingly rare today but was more common in earlier days and it is quite possible that most lakes had one or two old large monster catfish in them. There are also indications towards that the catfish if allowed can grow even larger then the monster catfish we see today and that fact might also add to the truth behind the myths of monster catfish. A variant of this monster catfish myth is the “"There are catfish at the base of the dam big enough to swallow a man whole! Divers inspecting the dam saw them and swore they'd never go down again. "” These myths of monster catfish are however nothing but myths and there are no catfish found in the US that are anywhere near the size of being able to swallow a man whole. 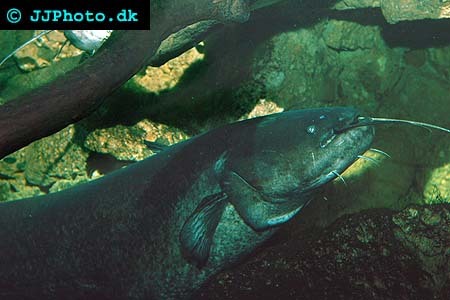 The myths about monster catfish in the US are however much more pleasant then the myths about monster catfish in Europe and Asia where there exists much larger species of catfish like the European Wels catfish that can be 5 m / 16.5 ft long and weigh 300 kg/ 660 lb (there are unconfirmed reports of larger fish). More than four times the size of the biggest reported catfish caught in the US and more then 5 times the biggest confirmed catfish catch in the US. Another giant can be found in the Mekong delta in Laos and Cambodia where the Giant Mekong Catfish can reach the in comparison relatively modest size of 3m / 10ft but these giant can reach weights upwards to 350 kg/ 770lb which makes them heavier then the length vice larger wells catfish. Both these monster catfish species are contenders for the throne of the largest freshwater fish in the world. Wels catfish is a catfish that grows to be true monster catfish. The myths about monster catfish that these huge catfish specie have created are that they eat children. This might sound like a macabre myth but the truth is that at least the wells Catfish is know to eat small mammals and their exist an supposedly “confirmed” report about a young boy being eaten by a monster wells catfish almost 50 years ago. However this is, if true, a freak incident and should not to be considered as anything else. The truth is that catfish usually don’t eat children, our babies, even if they are large enough to do so. Another more far fetched myth about monster catfish has its origin in ancient Japan where people believed that earthquakes where the result of a giant catfish trashing about. The catfish could only be constrained by a particular god that held a magical rock over the monster catfish: The monster catfish would take every chance to trash about if the god got distracted or lost his focus. There are most likely more myths to be found about monster catfish which shows the undoubtedly truth about these large fish, they are if nothing else good at getting our imagination going. Another truth about monster catfish, at least according to me, is that they are beautiful interesting fish that deserves to be allowed to stir our imagination.